The AMS560 Preamplifier (Gain=1000) is designed for use with the AMS220 to perform very-low resistance measurements (with excitation currents greater than ≈50 µA). The AMS560 can be also favourably used to perform sensitive measurements with DAQ devices not having millivolt ranges. 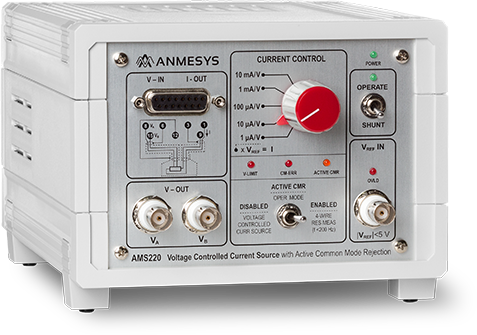 Frequency range of the AMS560 is from DC to 200 Hz, thus it covers the whole frequency range of the AMS220 operating in the mode with enabled active common mode rejection circuit. The preamplifier is powered from the AMS220.